My son Ben, who is grade 12, was hired this week to do some math tutoring for a young grade 8 student. He did the prep work necessary, getting a hold of the grade 8 curriculum, and making sure he knew what to expect. Before he left for his first tutoring session, he asked me if I had any last minute advice. I said, “don’t always just explain how to do things, be skillful in guiding her to ‘figure it out’ on her own”. I first heard the term “figure it out” (FIO) in 2011 from legendary coach Tim Boswell while he was trying to teach a future Olympian how to fake a shot at the point. He kept yelling “FIO. FIO” which of course meant “Figure it out. Figure it out”. We watched as the player made a few mistakes, then made a few adjustments then, all of a sudden, was able to perform the skill with no problem whatsoever. The term has stayed with me since and has become a very big part of how I approach teaching and coaching the game of hockey. Here is the final level of my Coaching Pyramid. It has four elements to it: Passing, Shooting, Skating, Read and React, Athleticism and Figure It Out. 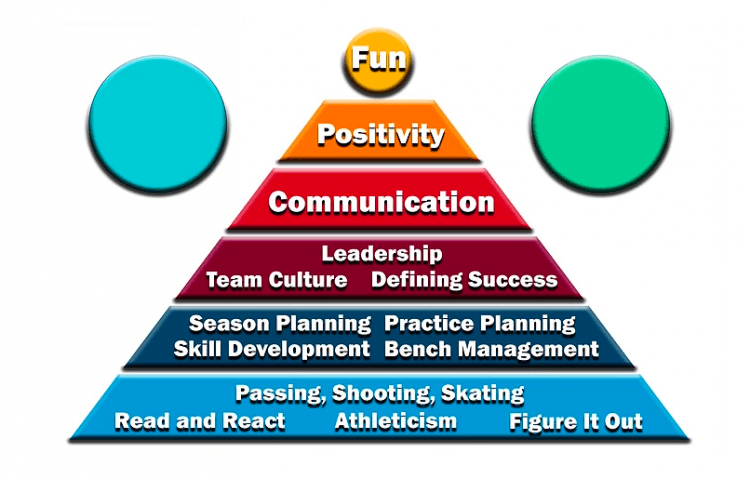 For me, these are the building blocks of coaching hockey effectively and as important as all the other elements of the pyramid are, these pieces are really about making your athletes better hockey players. I start my practice every day with “PSS” drills – Passing, Shooting, Skating. Now I know that I’ve left out stickhandling but that is just assumed to be part of this basic skill piece that we need to develop in all of our players. Clearly, these three things are crucial to player development. As a coach mentor once told me “the most skilled team in the league will win at the end of the season, so we want to be the most skilled team”. Developing skating skills, passing skills, puck handling skills, and shooting skills are the root to being the most skilled team in the league. Skill Development was part of the last level of the pyramid. Those skills don’t only include individual skills, they include individual tactics and many team tactics as well. In the base of the pyramid, we’re talking simple raw player skills. As coaches we need to work on these things all of the time – even when we’re teaching and practicing individual tactics and team tactics. I’m a big believer in letting players just play the game. Over the last number of years I’ve made a concerted effort to take out as many X’s and O’s out of the game as I can. I have watched players, particularly this season, absolutely flourish as hockey players being able to just go out and play. Two elements of the bottom level of the pyramid actually go hand-in-hand quite a bit. Read and React and Figure It Out both allow players to “self-learn” the game, but also allow them to get the coach “out of their head” when they’re on the ice. My example of good FIO is to take the players outside with some tennis balls and have them play the game Monkey in the Middle. At first I just let them play and in time, a very short time with the simple game, they figure out where the best place is to get the ball back. Now as a coach (teacher), we can debrief with our players and ask them where the best place is to get the ball back. Sometimes they’ll look blankly back so, you can ask “Is the best place at the thrower? In the middle? Or next to the receiver?” At this point, lights go on and they’ll all say “the best place to be is at the receiver”. Now when we step on the ice, we take this same principle to our forechecking. Once the initial forechecker is pressuring the puck carrier, where’s the best place for the next forechecker to get the puck back? Now the lights get brighter and they will say “we need to go to the receiver”. Allowing players to figure it out makes the lesson much, much more meaningful. Coaches need to also let their players be able to Read and React in all situations on the ice. It’s too easy for coaches just to say to players “if puck is in this area and their player is here then you go here”. Sure that might be a short-term fix that will win some games but, it’s not helping in the development of players that will, ultimately, make them much better in the long term. Allowing your players to have more free play in practice creates an atmosphere where they can develop their read and react skills. I have become a big believer in small area games in practice and will always end my practice with at least 10 to 15 minutes of gameplay. I typically do no instruction at this time and literally just let my players play the game – just like on the pond. And, although metaphorically, doing that is not improving your power play, in actual fact, it truly is. The last piece of the pyramid is Athleticism. When developing hockey players, we need to make sure that they’re becoming better athletes, not just better one sport athletes. Some things as coaches we can do to promote that include encouraging our players to play other sports in the off-season, working on movement skills in off-ice sessions and playing other sports as a team outside of the rink. As an example, I brought in a volleyball coach to do a beach volleyball session with my team early in the season, and then they played beach volleyball for an hour to develop their overall athleticism. Not only did it develop mew movement skills in the players but, it was a ton of fun! So that’s it for the core of the pyramid. Next week, we’ll talk about those two pesky, mystery circles in the top corners of the graphic. Below, you will find some links to past posts that support these four pieces of the bottom level of the pyramid. Coaches: How’s Your Skill Development Going? Are You Coaching with Too Many X’s and O’s? Are You Improving Your Players’ Athleticism? Rick Traugott is a lifelong coach who has been working with young athletes in many sports for the past 38 years. Since the 2010-11 season, Coach Traugott has been working with Canada's National Women's Team hockey program serving in a number of roles including camp coach with the U18 and development teams, and Video Coach with the U18, Development and National Women's Teams. 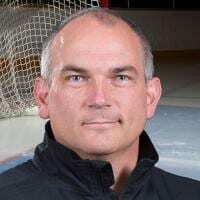 Rick was a member of the staff that won a gold medal with the U18 team at the IIHF World Championship in Budapest, Hungary in 2014 and a silver medal with the NWT at Worlds in Malmo, Sweden in 2015 and bronze with the U18 team in 2018 in Dmitrov, Russia. Coach Traugott's resumé includes coaching the Varsity boys and girls programs at Trinity College School, Ryerson University men's team, Wexford Raiders Tier 2 Junior A, Wexford Raiders Minor Bantam and Midget AAA, as well as the Brampton Thunder of the CWHL. He also served as Video Coach and Team Leader for the uSports Women's Team that competed at the 2017 Winter Universiade in Almaty, Kazakhstan where the team won a silver medal. This season, Coach Traugott is back behind the bench with the Trinity College School Bigside boys' team as they move back to the top division in the CISAA (Conference of Independent Schools Athletic Association).